Andrew Natsios is an executive professor at the George H.W. Bush School of Government and Public Service at Texas A&M University, a senior fellow at the Hudson Institute, and the author of Sudan, South Sudan and Darfur: What Everyone Needs to Know. Natsios served as administrator of the U.S. Agency for International Development and as President George W. Bush's special envoy to Sudan. The first test of the Obama administration's second term foreign policy team is shaping up to be North Korea's upcoming nuclear explosion. Korean President Kim Jong Un last week declared martial law in anticipation of the country's third nuclear test that Un has reportedly ordered be conducted before the middle of February, which will coincidentally occur on his late father's (and former leader of North Korea) birthday. This week a bellicose and belligerent North Korean government put on its official website a bizarre and provocative video of the bombing of what appears to be New York City with the caption: "Somewhere in the United States, black clouds of smoke are billowing... It seems that the nest of wickedness is ablaze with the fire started by itself." The video includes the launch of a North Korean missile, implying that if the United States puts too much pressure on them the consequence will be a nuclear response. The Chinese foreign minister on Wednesday issued a stern public warning to North Korea against the test, and the Chinese Communist Party official party newspaper published an unprecedented editorial saying, "If North Korea insists on a third nuclear test despite attempts to dissuade it, it must pay a heavy price." North Korea is in no position to anger its only remaining patron and ally, and yet it may go ahead with the nuclear test anyway. U.S. Secretary of State John Kerry has said that he regards the North Korean nuclear threat to be greater than that of Iran, which has yet to test its first nuclear bomb. Kerry's statement may reflect the growing concern of U.S. intelligence officials and members of Congress that North Korea now has both nuclear weapons and the means—intercontinental ballistic missiles—to deliver them. The nuclear test will come at a politically sensitive moment. The Obama administration's new foreign policy team is not fully in place. Three new heads of government in the countries most affected by North Korea's threats have recently taken office: Chinese President Xi Jinping who took office late last year as did Japanese Prime Minister Shinzo Abe, and South Korean President Park Geun-hye who will be sworn in shortly. President Park is the daughter of former South Korean President Park Chung-hee, who the North Koreans bungled an attempt to assassinate in 1974, but ended up killing his wife, and mother of the new president, instead. All three leaders have one thing in common, they all face domestic problems requiring their attention and do not want to be distracted by a foreign policy crisis their first few months in office orchestrated by the ever-troublesome North Korea. All three new leaders face diplomatic challenges with each other. China and Japan are quarreling over control of a small, uninhabited island in the China Sea. Debates in Japan about the need to rearm in the face of rising Chinese military power have unnerved South Korea which suffered under Japanese abuses in the first half of the last century when Korea was a Japanese colony. Why, then, is the 28-year-old ruler of North Korea, Kim Jong Un—himself in office for just over a year—exploding a nuclear weapon right now? One reason may be to distract the attention of Communist Party cadres, the North Korean military, and its long suffering population to a fictional external threat. He has been purging its geriatric government and military officialdom to put in place younger men, loyal to him, but the change of leadership is not going well. Rising official dissent appears to be spreading across the country from those who have lost political and military power. Fabricating an external threat may be meant to suppress dissatisfaction among unhappy North Korean elite. The only product the North Korean economy now produces of any consequence are weapons, since it cannot feed itself or provide consumer products for its population (except through imports from China). Kim promised—but has not delivered—more food, economic reform, improvements in public services, and a way out of the country's slide into oblivion. A sizeable portion of the general population has no economic livelihood or political power to command food and may be facing sustained hunger and even famine in some areas. The World Food Program in the summer of 2012 issued two reports which warned against a famine in 2013 because of a severe drought followed by widespread flooding and a typhoon which did extensive damage to the rice and maize crops. South Korea faced the same climatic conditions which reduced agricultural production. Mysteriously, in last November's crop assessment from the World Food Program and Food and Agricultural Organization of the United Nations, they announced a 10 percent increase in production, two months after their prediction of catastrophe. How could conditions have changed so quickly? Why was North Korea unaffected by the same drought and flooding which damaged South Korean agriculture? 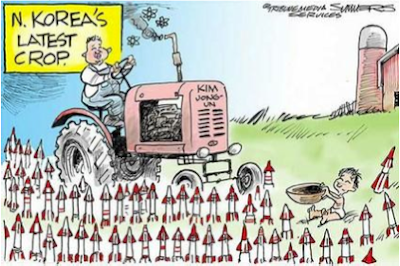 These most recent crop estimates lack credibility and likely reflect manipulated data by Pyongyang, since the North cannot admit declining production and a famine in the first year of Kim Jong Un's reign. So instead of reforming their economy and agricultural system, they fed their hungry population propaganda instead of food, the irony of which would have amused George Orwell. Famine may have returned to the North last year according to a new report issued in January 2013 by Asia Press International run by North Korean defectors based in Osaka, Japan. If the report is accurate, a famine took place in the southwest region of North Korea the first quarter of last year, in what is the richest agricultural area of the country. The famine was caused by Pyongyang's confiscation of a large portion of the rice crop in late 2011 to ensure the capital city (where the privileged elite live) and military were fed. Between 10,000 and 20,000 may have died in North and South Hwanghae provinces. We have another unconfirmed report, also from defectors I interviewed late last year, that in the northwest rice growing areas a famine killed between 6,000 and 8,000 people a year earlier. The Asia Press story also reported shocking instances of cannibalism, which I had heard similar stories about from North Korean refugees in China during the famine of the 1990s. Several reports from different sources say that North Korean soldiers are suffering from acute malnutrition because the food ration system appears to be failing. National Public Radio reported in a Dec. 10, 2012 story that the government had lowered to 4 feet 7 inches the minimum height for young recruits, a tacit admission of years of acute malnutrition severely stunting an entire generation of North Koreans. Evidence of the continuing food crisis facing the country come from an unlikely source: the farmers markets. Since February 2012 the markets in North Korea, which feed more than half of the population, have operated without interference from the central government which may signal a shift towards reform, since in the past, Pyongyang has grudgingly permitted them to function under duress, sending in the police to harass merchants and confiscate merchandize. The shift of policy towards the markets may be a way of reducing public anger at the economic and food situation, or it could be a tacit acknowledgement by the government of continuing food scarcity, hunger, and starvation. aid to the weapons programs we have trained the North to continue building missile and nuclear bombs, since it is the one way the North can capture their neighbor's attention and get help. North Korea has resolutely avoided any major economic reforms to build a market economy, because the leadership believes reform poses too many risks to the continuity of the Kim dynasty. So they let their population starve, while they use their scarce revenues to build weapons of mass destruction to threaten their neighbors. The one bottom line the North Korean ought to consider when they make their threats: One or two nuclear weapons does not pose any real threat to the United States or its allies, because should they attempt to use them, the United States will turn North Korea, as former Secretary of State Condeleezza Rice so famously put it, into "a parking lot." Threats must be creditable and the North Korean threats simply aren't. The bigger issue has always been the North Koreans selling their technology to a nonstate actor (read: terrorist groups) against which the deterrence principle is less effective. In any case it's time the United States tell Pyongyang that we aren't playing their games any longer—the game is over and it time for them to accept the risk implicit in any political and economic reform strategy and end their contemptible threats.